The Japanese Society of Dysphagia Rehabilitation (JSDR) was established in 1995 as a unique society emphasizing a transdisciplinary approach of dysphagia rehabilitation. The objective of the society is to perform activities including research, education, popularization, and structuralization in dysphagia rehabilitation to facilitate resolving the problems in individuals with eating and swallowing difficulties. The JSDR started with 1,600 members in 1996, and has been expanding its size rapidly. 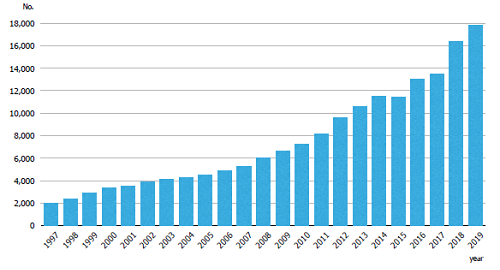 The JSDR has over 14,000 members (Figure 1). 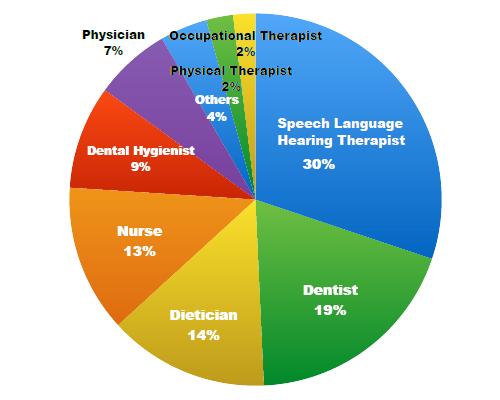 Multiple professionals participate in the society including physicians, dentists, speech therapists, nurses, dieticians (Figure 2). Three issues of the journal (JJDR) associated with the society are published annually. The best and second best papers are awarded every year. The best oral and poster presentations at the annual meeting are also awarded. “Dysphagia” has been an official English-language journal for the JSDR since 2006. Scientific meeting is held annually. The 17th & 18th annual meeting will be held in Hokkaido on August 31-September 1. The presidents are Shinichi Izumi (Professor, Department of Physical Medicine & Rehabilitation, Tohoku University) and Tei Kanchu (Professor, Graduate School of Dental Medicine, Hokkaido University). Feel free to contact us if you have any questions about us.